© 2017 SuZan Alexander, Digital Photography. 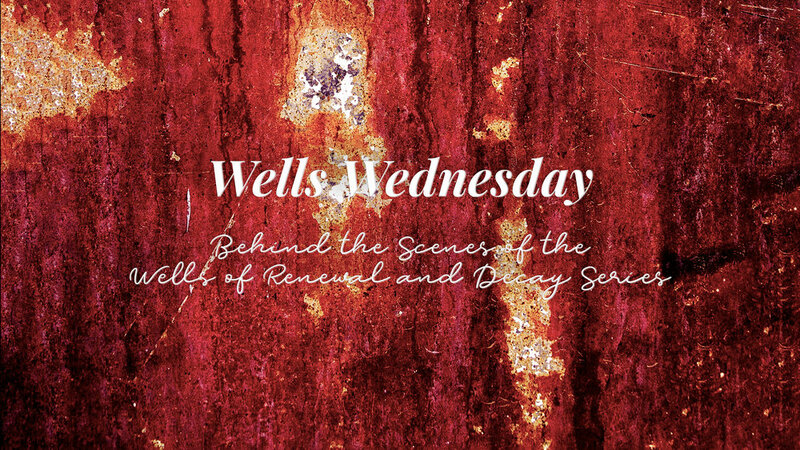 In the first Wells Wednesday, I wrote a little bit about how the Wells of Renewal and Decay series emerged. This week, I want to begin sharing some of the images from the series, as well as their stories. So, let’s get started with “Cruciform Abstraction”. You may have seen this image since it appears as the cover for the Wells of Renewal and Decay series gallery. One of my favorite livestock tanks to visit includes this composition. Each tank can include many compositions on its surface. This particular tank is rich with subjects to photograph. Sometimes it is difficult to decide which portion to focus on because each composition is unique, and each one seems to have its own story. But, at times, they are like a long narrative or mural, and making a decision of where the story has a natural end is a challenge. I have visited this particular tank, and this same portion of the tank, many times over the years. I think I am searching for ways to tell the story just a little bit better each time. Plus, I rather enjoy contemplating how this composition evolved and is still evolving. As with all of these images, I tend to wonder if the paint was applied in a way in which natural erosion and decay revealed the pattern, or, did the horns of animals that come to the well for water somehow etch a pattern over time? Is there a deeper meaning, and what might that meaning be? I am sure you will bring your own story and your own questions to ponder. When I look at this extracted portion of the tank, I see a strong Cruciform composition. In the Christian religion, crosses are strong symbols of sacrifice, death, and resurrection. The water contents of the tanks is another religious symbol of purification. It, therefore, seems appropriate that one of these life-sustaining vessels revealed a Cruciform on the surface, and that the frequent visitors of the tanks were once considered sacrifices for atonement. The blue background might represent sky, heaven, trust, wisdom, faith, significance, and/or importance. In many cultures, blue is a symbol of religious beliefs. I also think of the blue doors and windows on homes in the southwestern United States. The popular belief is that the blue keeps the evil spirits away. Certainly, the water residing in the tank is significant enough to protect. Red is most often associated with sin, anger, and blood. But, it is also a symbol of courage, sacrifice, and fire. The portion at the bottom does remind me of fire. On a rangeland, an uncontrolled fire is the visitor you fear the most. On the other hand, fire is also a symbol of the presence of God. I could share so much more, but I want to leave room for your story. I want you to find the stories and connections that are meaningful to you. The words and thoughts I have shared here are intended to help you find that story rather than lead you to only one story. I hope you will visit each Wednesday. Bring your own vision. Leave a comment. Tell me what you see in the graffiti of time.